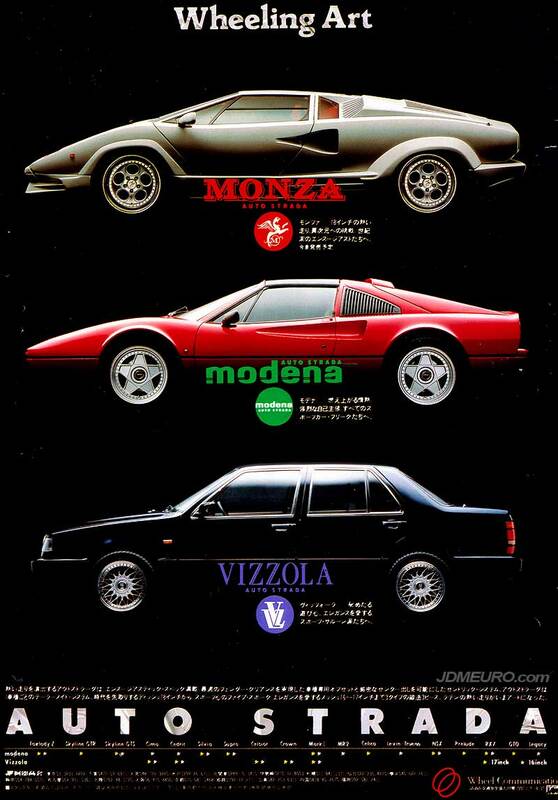 The Auto Strada Modena and Auto Strada Monza are JDM Wheels which resemble OEM Lamborghini and OEM Ferrari wheels. The Auto Strada Modena is a 5 star design JDM wheel with covered lugnuts and a hex cap; it resembles OEM Ferrari F40 wheels but is pictured on a Ferrari 328 GTS. The Auto Strada Monza features a 5 hole design which resembles an OEM Lamborghini Diablo Wheel design, however are pictured on a Lamborghini Countach. Also pictured is the Auto Strada Vizzola, which to me resembles the BBS RS. Do you know which factory made these? Everyone (myself included) goes around saying “Work Autostrada” but I’ve never seen any proof personally. Hi, do you know where it possible to find some parts for this rare wheels ? where did you find this poster? i would love to get a print made.